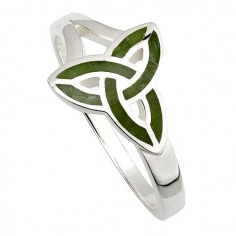 This Celtic knot ring has been designed using two snakes to create the knot and its head ends and the front of the ring. 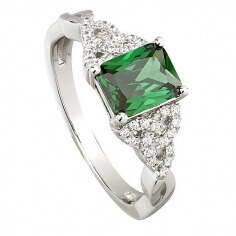 This leads to the vibrant emerald setting directly at the center of this ring. It is a lovely design that could be worn for any occasion or reason. 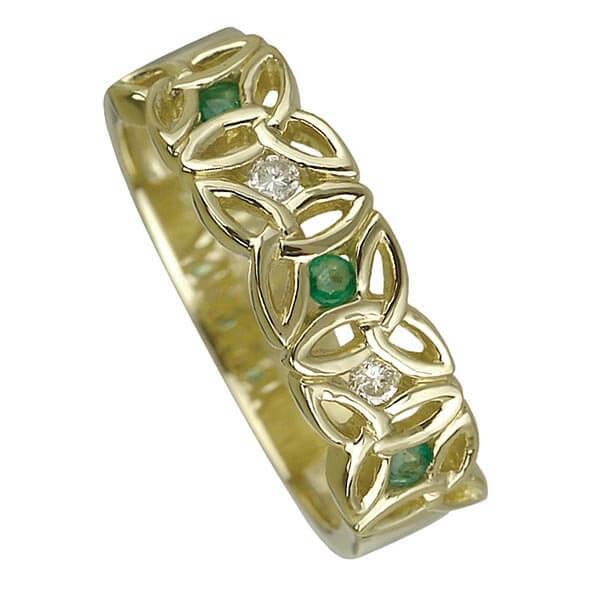 This ring is available in silver (with green CZ), yellow gold, and white gold. It could easily be a man or woman's ring and sizes are available from a 4 to 9. It would make a great gift for that person who loves Celtic designs and jewelry. Long before Ireland was known by the name that it has today that means “Emerald Island,” it was known by many other names. One of the earliest known names was Scotia. Supposedly, it received this name after the Pharaoh’s daughter Scota, who would marry a Geal, in the time of Moses. When the Geals would make it to Ireland, it would then become known as Eirinn. One of the sons that survived on the way over to Ireland, Eber, defeated a De Danaan army around the year 1000 BC that was led by Queen Eire near the mouth of Boyne. The island was then divided by Eber, his two brothers, and a cousin. Eber took the southern half, his brother Eremon received the top half, a northwest corner was given to their other brother Ir, and the southwest corner was given to their cousin Lughaid. Around the sixth century BC the island was known by many different names in different areas. Orpheus referred to it as “Ierna.” Plutarch called it “Ogygia,” and Caesar referred to it as “Hibernia.” This last name was a variation of Ivernia, which was the name of the people who lived on the south of the island. Around the seventh century the northern part of the island was referring to it as Ireland. There have been many that speculate this was given because of the third brother, who drowned. The family might have named this area after him, and it caught on. Others believe that the people of Queen Eire used the name to describe the island. Either way the name has come to represent how lush and green the island actually is. Most people associate the name with the beauty of the country.